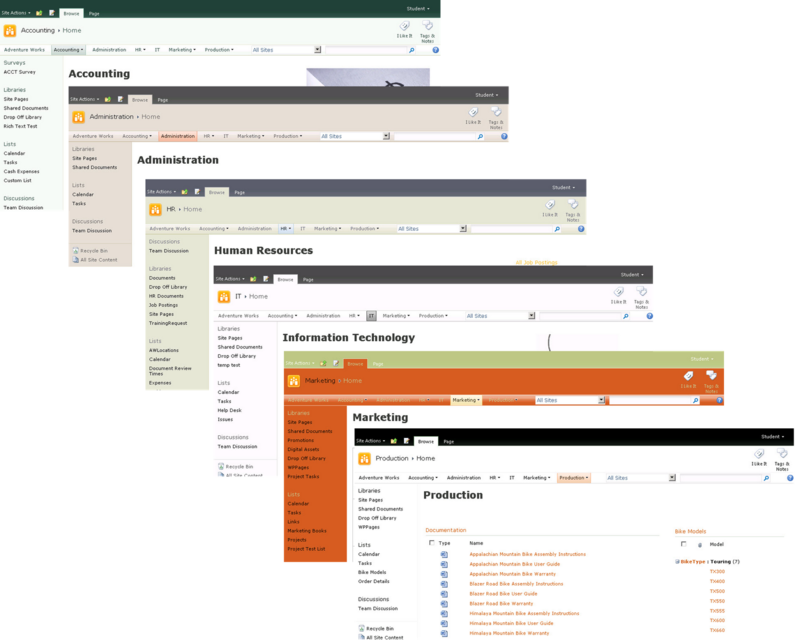 SharePoint provides many tools for providing navigation throughout a site collection. Typically, the Top Link Bar near the top of each content page provides links to subsites, and this can be set to persist down through the hierarchy. (This bar is referred to as Global Navigation in SharePoint Standard and Enterprise.) The Quick Launch Bar on the left (called Current Navigation in Standard and Enterprise) typically provides links to lists, libraries, and other content within the subsite. A Tree View is also available in addition or instead of the Quick Launch Bar. Finally, links may be placed manually on the Top Link Bar or Quick Launch Bar, or may be placed anywhere on a page via a Links list. In addition, SharePoint provides navigational aids through the Browse menu and the breadcrumb navigation path found on every page. These tools can help you understand where you are in a hierarchy. However, the Top Link Bar on a subsite might not inherit from the parent site, and in that case the breadcrumb and Browse menu won’t provide a complete drill-down trail. In addition, in large site collections it can be easy to get lost in the hierarchy when you start clicking around. One technique that can help users stay oriented is to use site colors as visual cues. While we teach look and feel customization in our courses Introduction to SharePoint 2010 – Using SharePoint Foundation 2010 and Introduction to SharePoint 2010 - Using SharePoint Server 2010, this post will show how these features can be used not just for their own sake or general branding purposes, but to enhance the user experience. In SharePoint Foundation, you are limited to the built-in themes for color (and font) schemes; SharePoint Standard and Enterprise allow customization of themes on an element-by-element basis. Of course, in any of these editions, custom themes or CSS code can be developed to accomplish even greater customizations. In the site collection example, there is one top-level site and six subsites; many of the subsites have additional subsites, some for several levels. 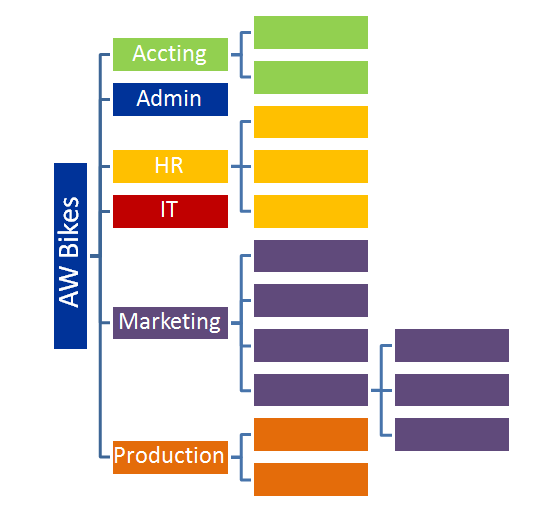 The goal is to make each branch of the hierarchy visually distinct, to help users understand when they are in the HR branch versus the Marketing branch, for example. Users rarely start at the top level and drill down. So, this technique may be especially helpful when users follow a link posted somewhere or sent to them in email, or even when using a bookmark they’ve made. The first two examples below use only the built-in browser-based tools to apply strongly contrasting schemes. 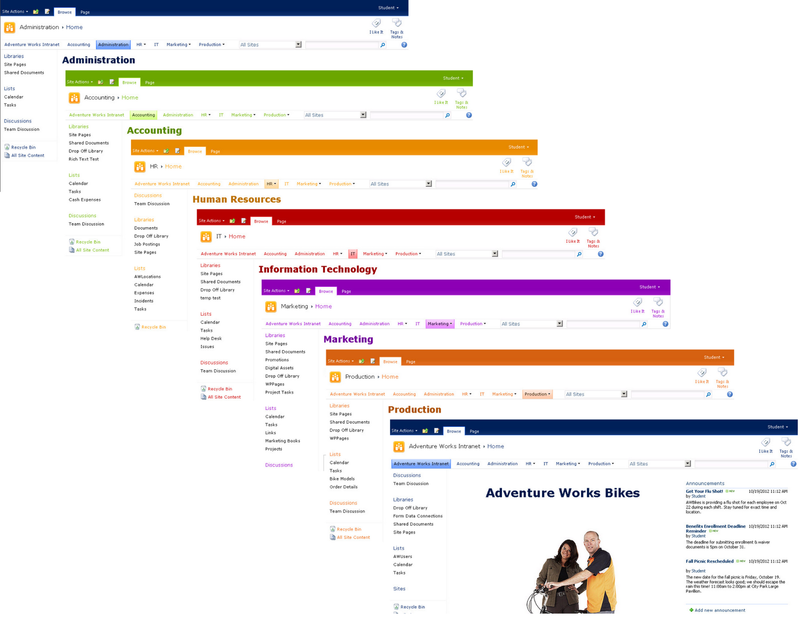 The first option, available to all editions of SharePoint, is to simply choose a different Theme for each branch. The top-level site of this site collection retains the Default theme. The Administration branch also retains that theme. Here’s an example of what the other branches might look like after applying different built-in themes. The problem, though, with using the different out-of-the-box themes is that the site collection gets a higgledy-piggeldy look, with no unifying look and feel. In addition, the site collection may have more branches than can comfortably be differentiated by themes, given that some themes may not be suitable for a number of reasons. Also, themes include font choices, and it may not be desirable to have different fonts in various areas of the site collection. Environments which have SharePoint Foundation only may need to turn to custom solutions in those cases. Environments with SharePoint Standard or Enterprise have another option. On corporate web sites, the color schemes might already be mandated and set up for the entire site collection (or site collections), but even then there may be room for variation that can help users. In the case of a site which adheres to corporate branding standards, such customization would be simple to tweak to provide the types of variations that would provide visual cues. For example, if the dominant corporate color is dark green with accent colors of gold and black, different combinations of those three colors, including shades and tints based on those colors, could be used as dominant and accent colors. Another option is to simply change the site icon in the upper left corner. Again, there may be corporate standards regarding the logo, but usually certain variations can be allowed or developed. In our example, a simple two-color line drawing is an accepted variant of the logo. 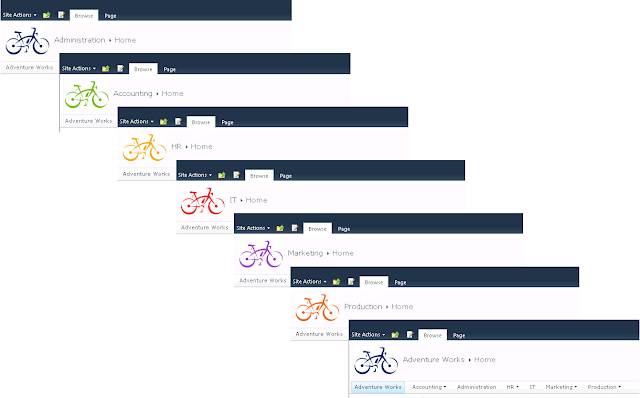 Using the same color schemes described above, alternate versions of the logo can be created and used to replace the default SharePoint icon at the top of each page while retaining a single theme throughout the site collection.